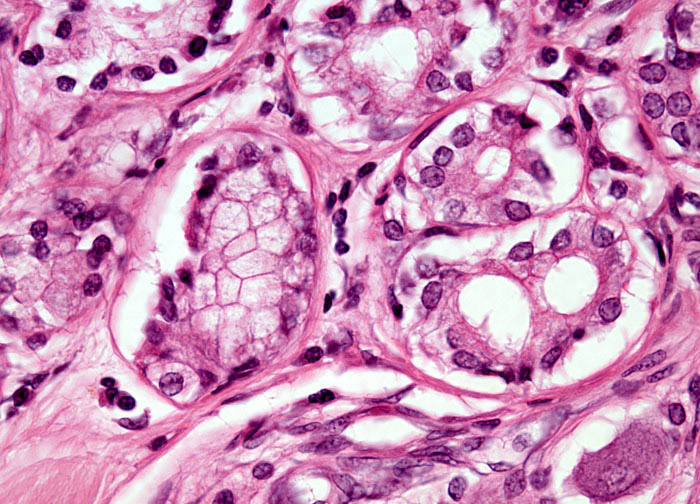 Adenocarcinoma is usually a slow-growing cancer, but can be difficult to detect because the disease typically involves the periphery of the lung, resulting in fewer early symptoms than cancers that develop centrally, near the airways. When signs of the disease do occur, they may include painful breathing, shortness of breath, wheezing, and a persistent cough. Oftentimes, lung adenocarcinoma has already metastasized by the time any symptoms develop, resulting in an overall five year survival rate associated with the disease that is less than 20 percent. Secondary tumors most commonly form in the opposite lung, the brain, spinal cord, bones, liver, and adrenal glands. Additional symptoms related to tumor growth in these or other areas of the body sometimes develop before signs of the primary tumor.